The marque on the Egyptian Theatre is pictured before the opening day of the Sundance Film Festival in Park City, Utah, Jan. 21, 2015. Gun violence was on the minds of more than a few filmmakers this year. The wave of films dealing with essentially the same subject - mass shootings in America - is both a coincidence and an indicator that the filmmaking community is engaging with the national consciousness. 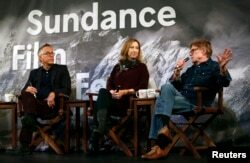 Sundance Film Festival director John Cooper (L-R), executive director Keri Putnam and founder Robert Redford address the media at an opening day news conference for the festival at the Egyptian Theatre in Park City, Utah, Jan. 22, 2015. Sundance founder Robert Redford echoed Groth's sentiments, joking that if they did seek out certain issues to spotlight, he'd make sure there would be lots of environmentalist films. But he also sees why the gun issue is so urgent for filmmakers. "Speaking Is Difficult'' director AJ Schnack believes the multiple films were borne out of frustration and a feeling of powerlessness. Director Kim Snyder goes deep into the community of Newtown, Connecticut, in the aftermath of the Sandy Hook Elementary School shootings where 20 children and 6 educators were murdered. In her documentary, Snyder explores the lives of those affected by the tragedy - the parents of children who were killed, parents of children who survived, Sandy Hook teachers, local law enforcement, religious leaders, and even a volunteer EMT. Katie Couric and director Stephanie Soechtig ("Fed Up'') returned to Sundance with a sweeping overview of guns in America - melding jaw-dropping stats (like how gun stores outnumber Starbucks and McDonald's combined in the U.S.), historical perspective (how the NRA used to stay out of politics), and emotional accounts from the families of the deceased (including mothers in Chicago and the brother of a girl killed in Aurora). They also speak to a variety of pro-gun advocates, from those who support background checks to those who scoff at the idea. "Speaking is Difficult'' may never be finished. The short documentary is a living film, meaning every time there is another mass shooting, director AJ Schnack and his team will update it. He'd submitted a rough cut of the film to Sundance months ago and had to update it twice since then as new events occurred. Schnack's film shows the locations of the shootings, as they exist now, overlaid with 911 calls from the event. Schnack found the now-normalcy of the settings quite striking.